INSIDER TIP: Sunset cocktails on the roof terrace listening to the call to prayer. A quintessential and unforgettable Turkish experience. 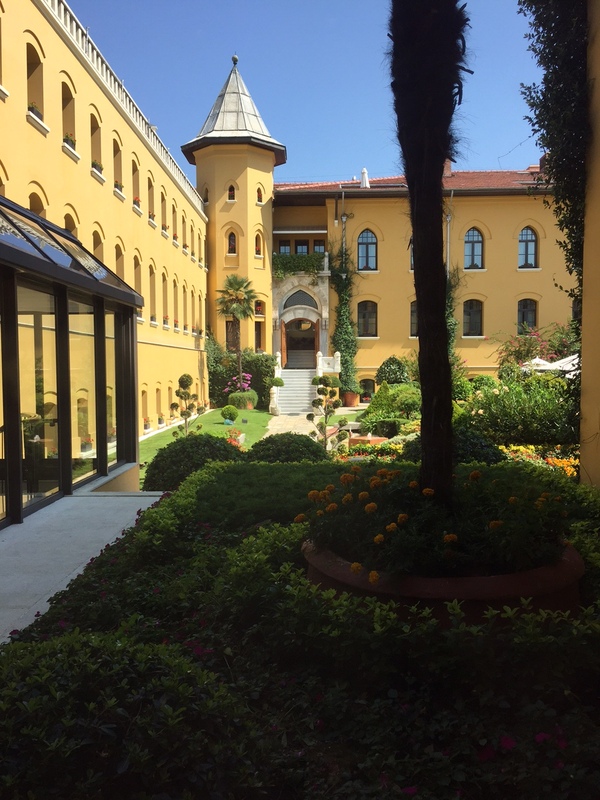 Nestled between the tourist hot spots of the Aya Sofya, the Blue Mosque, and Topkapi Palace, the Four Seasons Istanbul at Sultanahmet is a perfect location to base yourself in Istanbul – particularly for first time visitors as all the major historical monuments are within easy walking distance. This part of the city conjures images of the Constantinople of old, with spice traders and merchants rubbing shoulders with explorers; a very different experience then you will have on the Taksim Square side of the city, with its modern eateries and stylish boutiques. Take a walk along Divanyolu Cadessi to reach the Grand Bazaar – only about 15 minutes, past shops, restaurants, and Mosques. The hotel forms a square, with half the rooms looking in on a lovely garden and restaurant. We stayed in a Deluxe King category room, comparable to most junior suites, such was its size. Sporting views looking down to the garden, glimpses of the minarets of Aya Sofya, an oversize bathroom with deep soaking tub, luxurious amenities, and a small entry foyer, this was both elegant, and comfortable. For the fitness inclined, the hotel offers a very well appointed gym in the lower ground floor; large change rooms are stocked with toiletries and big fluffy towels. There is also a large, clean sauna, and rain shower with body jets to rinse off and cool down in. For those guests wishing a full Turkish spa experience, you can enjoy the facilities at the Four Seasons Hotel Istanbul at the Bosphorus (a short drive or tram ride across town), or visit the local Hammams (the AyaSofya Hurrem Sultan Hammam is just up the road), where you can be massaged in a mountain of soap bubbles, and scrubbed to your shiny-skinned best! Overall our stay was very good. For its location, comfort, and service, I would certainly recommend the Four Seasons Hotel Istanbul at Sultanahmet – particularly if you want to immerse yourselves in the history of the old city, but enjoy a little bit of pampering and luxury while you do it. Italy’s back on our European bucket list (as if it was ever off). Prices start at EUR€540 + tax per night. Book with us for additional amenities like preferential access to room upgrades, complimentary breakfast and hotel credit across the hotels. London Town (with a little story about Pogacsa Penny). Toscana,Venezia, Firenze e Roma – ti amo! It’s early morning, birds are chirping and the church bells are ringing outside as I write this from our lovely villa in Incisa Val d’Arno, Tuscany (Italy). Located about 20 mins outside Florence on the fringe of the city, Relais Belvedere is perfect (www.relaisvillabelvedere.it) for our needs. It’s been quite the couple of weeks so will rewind to where #goldmanadventure left off in my last post and give an update on what we have been doing. We had the most wonderful stay at Terre Blanche (TB). This resort has the best kids club and Concierge team I have ever seen and experienced.I know it’s a big call,but it’s true. The kids participated in many activities including painting, swimming, games and kids club lunches and dinners (great options) which meant that Nat and I could have some quality time and enjoy what the resort had to offer. I loved the fact that the kids club nannies (plenty of supervision for kids of all ages) would come up to us at breakfast and ferry the kids into very cute kids club buggies and then whisk them away to the club. The concierge team couldn’t do enough for you when enquiries were made about where to eat or where to go. Maps were always at hand and car stocked with cold water and engine running when we were ready to depart. Special mention to ‘Eladia’ at the concierge team. She really is a star at TB. The area that this resort is located is perfect for families or couples. There are six quaint towns located within 10 – 25 minutes away and we got to explore each one during our stay (Seillans, Fayence/Tourettes (giggle), Callian, Montauroux ,Saint Paul En Foret and Mons). One was cuter than the next although my favourite two were Fayence (for the wonderful weekend food and clothes markets) and Callian (for the atmosphere and fantastic restaurants for the kids). Walking around and listening/seeing both villages in action was a really joy for me and the family as we really felt immersed in the French countryside. One of my favourite things about the area actually was the SMELL. It rained on and off for a bit during our stay at TB and once the sun came out after a downpour, the smell of the Lavender was intoxicating. I just stood there and breathed it all in. It was like being in an outdoor L’Occitane who were having a sale on everything Lavender (get it?). We also loved paddle boating around Lac de Saint-Cassien (Lake Cassien) and having lunch at one of the many beach clubs around this beautiful lake. We decided to get a bit more adventurous during the last couple of days while we were at TB, so we drove to Mougin for dinner (famous medieval town known for its beautiful art and jewellery), Nice for the day (how are those rocky beaches?!! ), and Monaco for ice cream (as you do). All up, a wonderful experience and I can’t wait to explore this region further in the future. I am so happy I have a better understanding of this area now! We bid farewell to TB and drove about 5 hours east along the A8 to chic Forte Dei Marmi (FDM), Italia! What a drive that was. I love driving in Europe, it really gives me a sense of freedom and speed (they drive VERY fast even in the slow lane). We stopped for lunch at a really cute sea side beach town called Pietra Liguria which was a real find. Lots of locals enjoying the beach and sunshine. We had lunch in the main Piazza, had a great coffee and then headed back to the car and the final km’s to FDM. It’s so strange to cross an open border from one country to the next and suddenly the street signs, architecture and language just change. From one moment to the next. Imagine that happening in Australia? Food for thought. Oh.. and while we are on the topic of food. I ate so much cheese in France that I almost felt like I needed to hand over my Medicare card over at every Fromagerie I walked into. Just sayin. So, we drive into FDM, check into our hotel (www.unahotelfortedeimarmi.it) and met up finally with my best buddy Steve, lovely KD and little one Evie. So happy to meet up with them and have a wonderful couple of weeks! The hotel was clean and comfy with a great pool for the kids. Located about 5 mins drive from the centre of town, UNA was perfectly located for our needs. Walking around this town at night was a real treat. Everyone dressed up and riding beautiful Italian bicycles, laughing and having wonderful conversations (I think). It’s a town that makes it easy for one to smile and appreciate life. Food + fashion + beach + great Italian food = Forte Dei Marmi. Steve and I visited an Italiano barber, had shaves and buzz cuts and we all went to the beach and soaked it all up.They shut down the middle of the city during the evenings so it becomes a really great place to walk around, have dinner, get some ice-cream and even enjoy the fun amusement park they set up for the summer. The kids loved the mini motor cars that are set up for kids to drive around the main Piazza. Oh.. they also throw in some poor ponies that you can ride in the midst of this mini car mayhem as well. Picture that.. kids screaming with delight driving mini cars chasing mini ponies. Not a good mix but somehow it works. Poor ponies. As mentioned we are now in Tuscany and will post more about this in my next post. We have visited Florence (I honestly love this city) and already enjoying the vino. I am so delighted that Goldman Travel won Best Corporate Agency (single location) in Australia last Saturday night at AFTA’s National Travel Industry Awards 2014. Well done to the team ! Many thanks to all our wonderful suppliers who put in their nominations for us. It really makes this trip so much more special. Onwards and upwards GTC! !